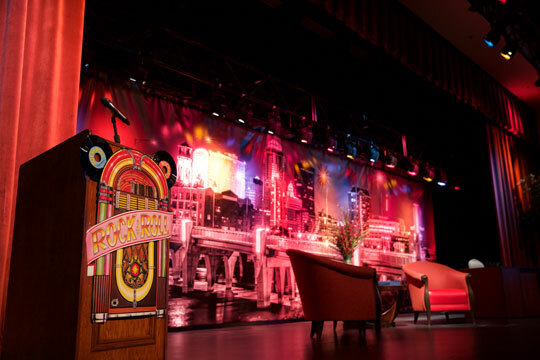 The 45th Annual Des Moines Area Association of REALTORS® Banquet held on January 30th at the Prairie Meadows Event Center was a star-studded—and humorous!—success, with record breaking attendance. Members and guests appropriately walked the red carpet, showed off their fashion sense and took selfies as they entered this year’s event titled Late Night with DMAAR. Drinks, dinner and dancing were all part of the evening’s activities. The event also provided the opportunity to acknowledge many members for their outstanding achievements throughout 2014 including those who were named as Volume Winners, Unit Winners and the REALTOR® of the Year, Jennifer Clark. Incoming DMAAR officers were also sworn in. But the night’s fun was all about Late Night and the “Stars” that made an appearance on stage, bringing a lot of laughter and gasps from the crowd. Ellen, David Letterman, Jimmy Fallon, Tina Fey and Amy Poehler look-alikes were all on hand to rock the evening’s activities.